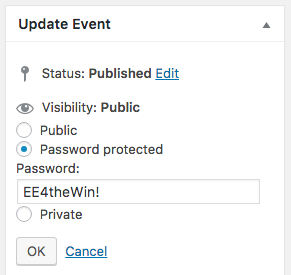 With Event Espresso 4 you can set a password for every event created so that if a user comes to your WordPress events website to register for an event, the user needs to enter the event password in order to see the event details and to register. Password protected events are helpful for event organizers who have events for special types of attendees. This can be helpful for association member-only events, VIPs, vendors, or employees. You can also use this password restriction at the beginning of an event to invite only special guests when registration opens to grant special access, and then remove the password restriction later on when you want the general public to access the event. See also our feature to restrict access with custom capabilities. Don’t forget to update, save or publish your event. From there on, website viewers will be prompted to enter the event password for this event to access that event page.